Dexion Grating Modules can be positioned across pallet racking beams to act as a shelf within the racking. Due to their strong construction from press locked steel strips they can be used for both light and heavy duty operations. Designed to hold in place once positioned on the racking, the grating module provides a secure shelf for any loaded materials. A hot dip galvanised finish makes them ideal for use in high humidity and external operations, while a sizeable cross-section also makes them suited for ambient warehousing, chill stores and freezers as they permit the free flow of air to maintain temperature. 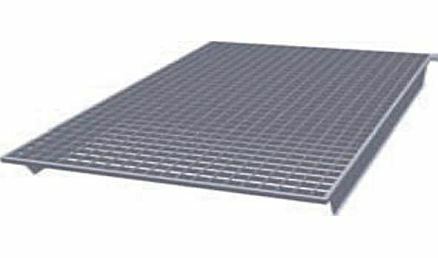 Their grating makes them a safer option than wooden decking as they allow the adequate dispersion of sprinkler water within the system. Grating modules’ strong construction makes them capable of storing pallets within the boundaries of the beams they are resting on (the pallets do not need to rest on the beams themselves unlike steel, wooden or chipboard shelving). They can also act as a safety guard over tunnel bays to prevent falling objects causing injury or obstruction. Available in a range of sizes and load capacities, grating modules can also be customised to suit specification. For more information on custom models call our sales team on 08082399422.